Mr E R Gudge of Lower Bourne near Farnham in Surrey commenced trading at 44 Frensham Road Lower Bourne on 3rd January 1921. The premises became known as Crossroads Garage, and a building was constructed for car, cycle and motor cycle repairs. In addition the company owned two cars which were used for private hire. Unfortunately on the 3rd of January 1923, one of the hire cars caught fire, resulting in the destruction of the garage, all stock, tools and customers cycles. The business continued under temporary cover, and sometimes using the customers’ own garage space. The decision was taken to completely clear the site and to construct a new larger workshop. 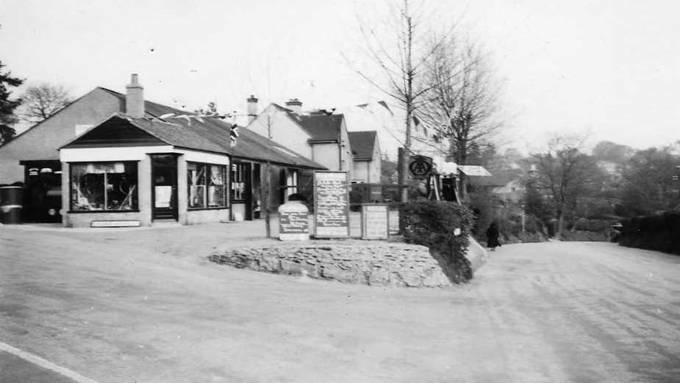 The village of Lower Bourne at that time only had about 20 car owners, some of whom dealt with other garages located in Farnham. In 1925 it is known that E R Gudge was selling cars and cycles and providing cars for private hire, but not involved with coach hire. As a natural extension to the car hire side of the business, the decision was made to operate vehicles for passenger transport. 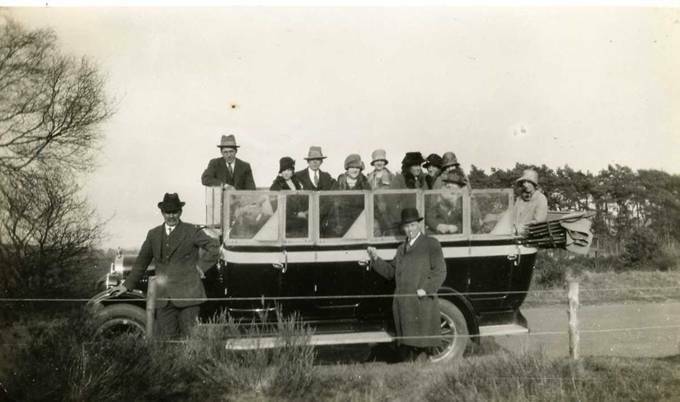 In 1926 the first coach was purchased, a second-hand 14 seat Chevrolet Reg. No. PK 3257. The Farnham Herald archives stored on microfiche at Farnham Museum have been painstakingly gone through for the years 1924, 1925, 1926 and 1927. On 31st January 1925 E R Gudge advertised Car Hire, car and motorcycle sales and repair, and general accessory sales. No entry was made during 1926 and it is thought local trips were undertaken which were not generally advertised. The locations for the first trips are not documented, but it is thought that this early photograph was taken near Hindhead in Surrey. Due to the high vantage point, this area was and still is a popular stopping off point on the A3 London to Portsmouth road. On the 7th May 1927 this advert appeared and was continued on a weekly basis until the middle of October. Around this time, to give you some idea of prices, 10 cigarettes were 5½d (2p), beer 7d (3p) a pint and Aldershot and District Traction Co charged 5s (25p) for a day trip from Aldershot to Hampton Court! A Chevrolet lorry cost around £230, to which was added another £30 if it was delivered with a canvas tilt. A Chevrolet car was £250, with a Fiat 18 hp priced at £315 and a Fiat 7 HP Torpedo at £250. In July 1929 and April 1930 a further two 14 seat vehicles were purchased, these being a Chevrolet LQ (YC 7055) purchased as new with a Wilmot Breden body, and a Chevrolet U (GF 4815) which was second-hand from Deptford, London. 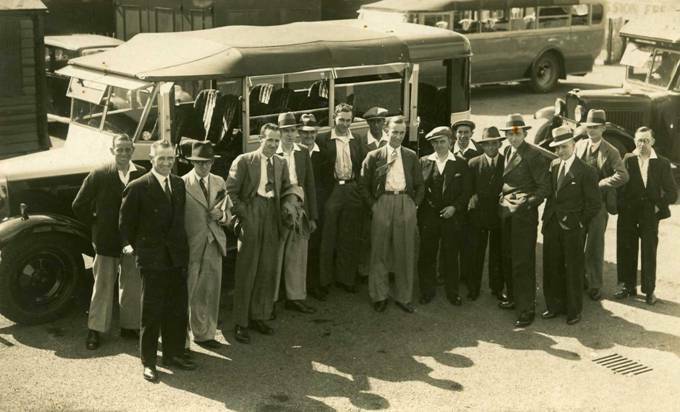 Mr Tom Wilmore was the first driver employed by E R Gudge for driving the hire cars, and then coach work as the fleet increased. He lived opposite Crossroads Garage in Lower Bourne, and was still with the company in the early 1950s. From 1933 to 1939, the company increased the fleet by a further five vehicles, these being two 20 seat Commer Centaurs (APF 296 and BPF 343), and a 26 seat Bedford WTB (EPA 757), fitted with bodies from E D Abbott of Farnham. 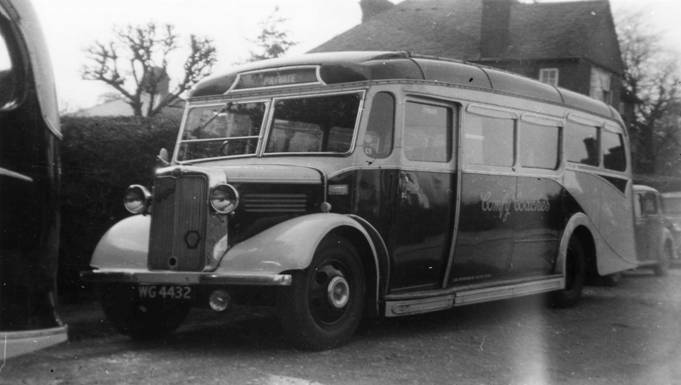 A 14 seat Chevrolet (OY 3654), and a 26 seat Bedford WTB (HPL 311) fitted with a Duple Hendonion body, completed the fleet requirements prior to the outbreak of war. 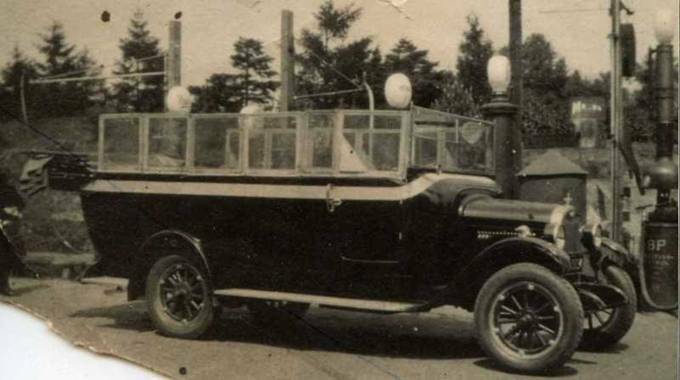 The vehicle shown is APF 296 or BPF 343, identified as either by the distinctive Abbott body. The date or the occasion (which is most certainly women and children only) is unknown but is circa 1935. The location of Portsmouth is clearly identified on the building in the background. Several photographs of the early vehicles are shown at this location, which proves the popularity of the Portsmouth excursions, and this ideal position to photograph the event. Mr E R Gudge was the driver on this occasion shown in the white cap; drivers were now wearing caps and dust coats. 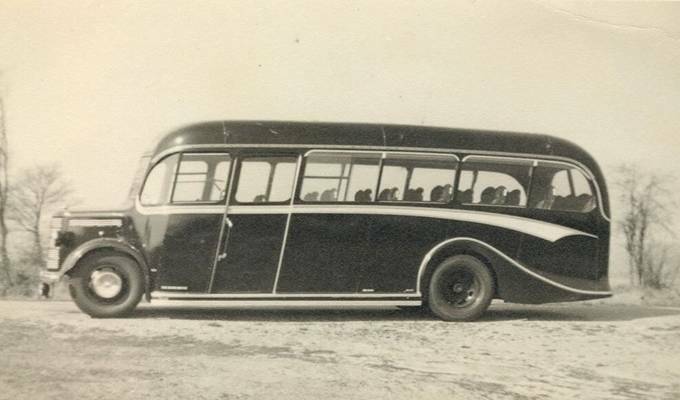 During this period the company had quickly become established as a reliable company undertaking Daily Excursions, and as a Private Hire Specialist. 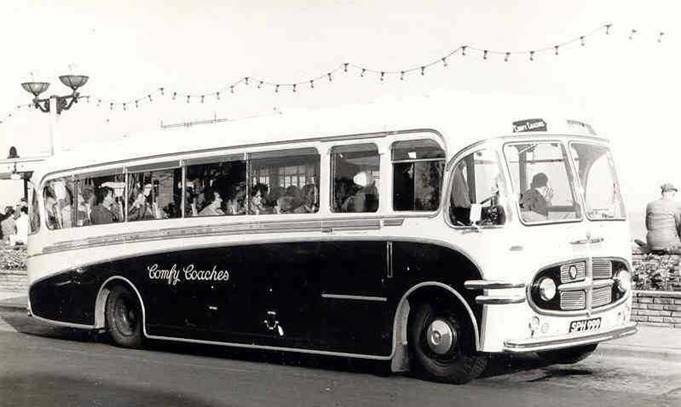 The policy was to provide comfortable clean and reliable travel, hence the eventual name taken by the company of Comfy Coaches. The declaration of war in 1939 virtually shut down coach operations, and parts of Crossroads Garage were requisitioned as an Auxiliary Fire Service Station which was manned full time. During 1940 a contract for the conveyance of workmen and E.N.S.A artists kept the coach business viable until the end of the war. The close proximity of Aldershot Garrison helped to provide this much needed business. In June 1940 a 26 seat Bedford WTB (EUR 364) was purchased and in February 1941 a 20 seat Bedford WTB (WG 4432) both with Duple bodies. WG 4432 was first registered at Falkirk in 1936, and EUR 364 at St Albans in 1939, these vehicles being purchased second hand. Previously, both had been operated by the WD and arrived in camouflage. EUR 364 has been traced working in the Windlesham area to around February 1955, from where it was exported in June 1957. WG 4432 was sold to A Weller, a local company, and from there to an unidentified owner in Suffolk when it was eventually sent for scrap in December 1963. In 1943 a 26 seat Dodge SBF (DAO 179) was added to the fleet, this vehicle also being purchased second hand. With the exception of PK 3572, all these vehicles were with the company at the cessation of hostilities. The company was now allowed to recommence work, although this was restricted to a 35-mile radius which made Southsea a popular destination. These excursions were heavily oversubscribed with passengers from the surrounding area, people who were determined to return to their normal ways of recreation. EPA 757 was used during VE parade celebrations in Lower Bourne and Farnham. 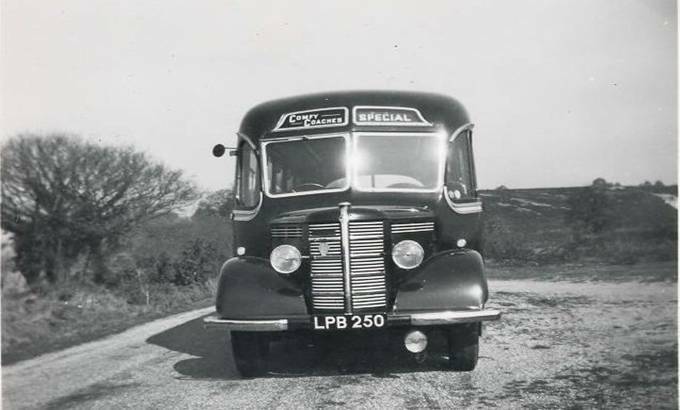 In March and August 1947 the first two Bedford OBs came into service; both 29 seat, LPB 250 and LPG 109 were Duple bodied. July 1948 saw the acquisition of a 32 seat Tilling Stevens K6-17 (MPF 536), with Chevrolets YC7055 and GF 4815 being withdrawn and sold. 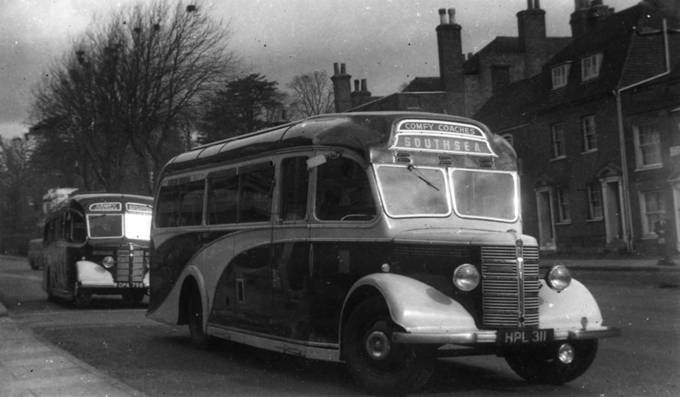 1949 saw three additions to the fleet; two Bedford OBs (NPA 73 and NPG 655), both with 29 seat Duple bodies, and a Maudsley M3 with a 33 seat Duple body (NPC 777). When new, several publicity photographs were taken on Frensham Common. The decade commencing 1950 is considered by most to be the golden period of coach travel. The country was returning to normal, rationing was reduced, and people wanted to be entertained. 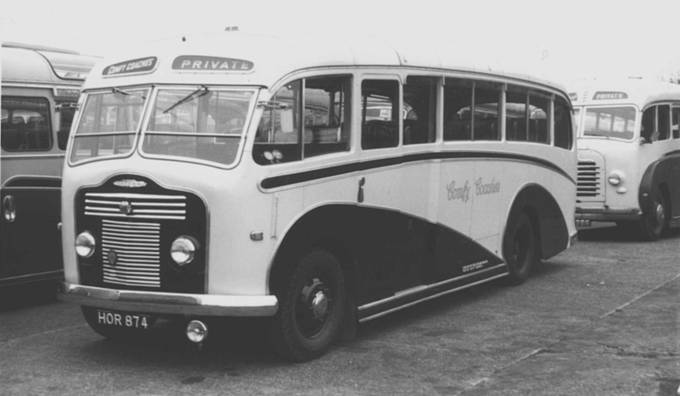 In January 1950, two Commer Avenger 33 seat coaches were purchased with all-weather bodies, these being HOR 874, and HOR 875. Mr John Campbell, who was a driver in the mid-fifties, tells us that the braking system on the Commer was a little temperamental; one of the Commers being driven into what was known as the top garage refused to stop and ended up knocking out part of the end wall! These were followed in March by a 29 seat Bedford OB (OPA 798), and in May with another OB (HOU 377), both with Duple bodies. This was a substantial investment for the company, and reiterated its intention to give the passengers reliability and comfort. No additions were made during 1951, but this year saw the disposal of the first Commer APF 296, and the only Dodge ever operated by the company, DAO 179. There were 2 additions to the fleet in 1952; firstly a Bedford SB (RPE 250) sporting a 37-seat Gurney Nutting body. 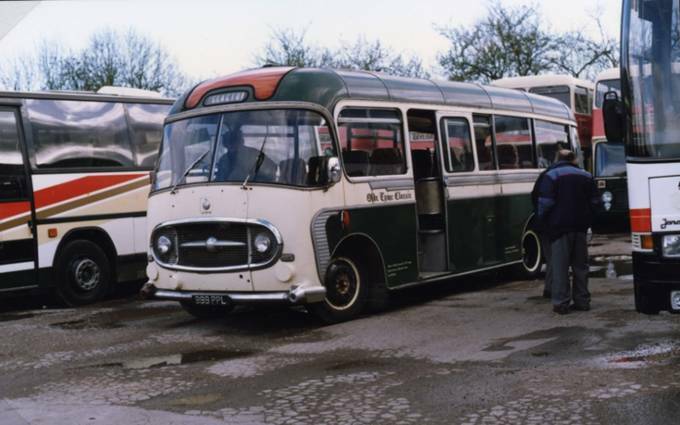 This was a departure from the Bedford/Duple combination previously preferred by the company. Gurney Nutting were better known for producing luxury and sport car bodies, this produced a vehicle that proved to be a classic design for the period. 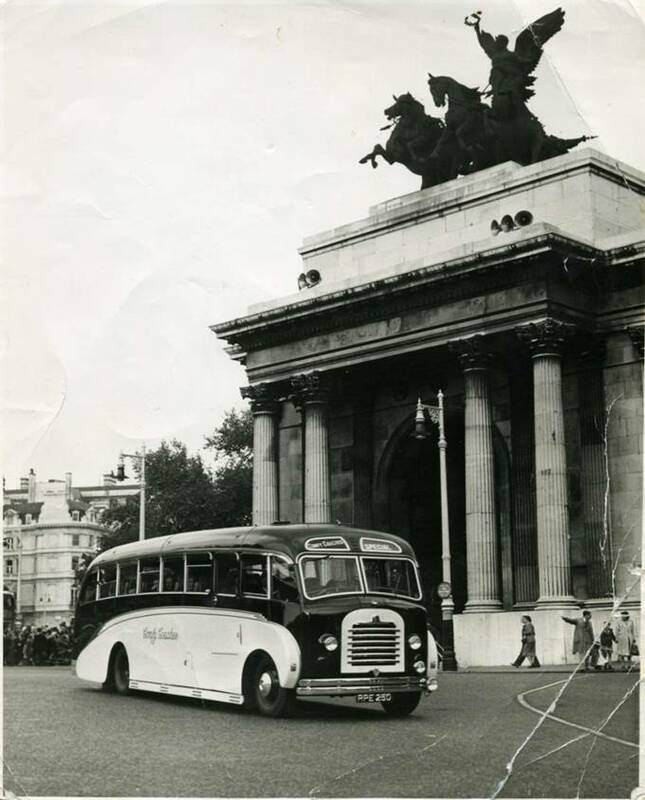 RPE 250 at Wellington Arch, London, in the traditional livery of maroon with ivory side panels. RPE 250, location unknown. Ivory by then being preferred as the dominant colour. 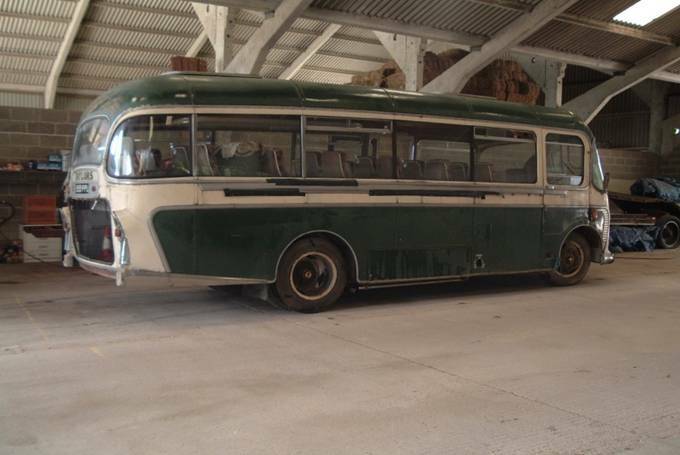 Secondly, a 33 seat Bedford SB (KCG 252) with Duple bodywork was also acquired. This vehicle was last traced working in Solihull in 1972, ten years after being sold by the company. Disposals in 1952 were Commer BPF 343, Bedford LPG 109 and Tilling Stevens MPF 536. 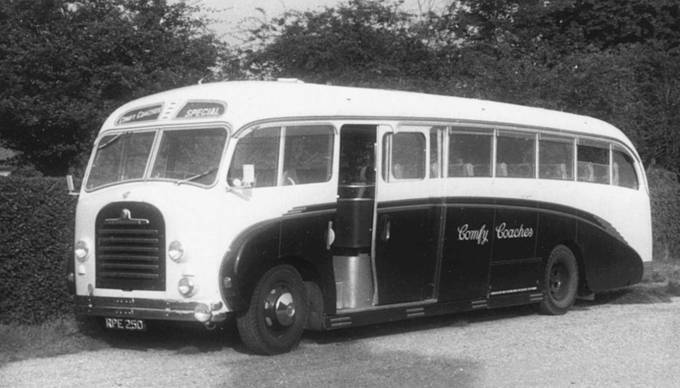 During May 1953 the first Bedford with a Plaxton body was purchased, a 36 seat SBO, (SPH 999). This was the first vehicle to have 999 within the registration, which was to eventually become the preferred and distinctive form of registration plate used by the company. 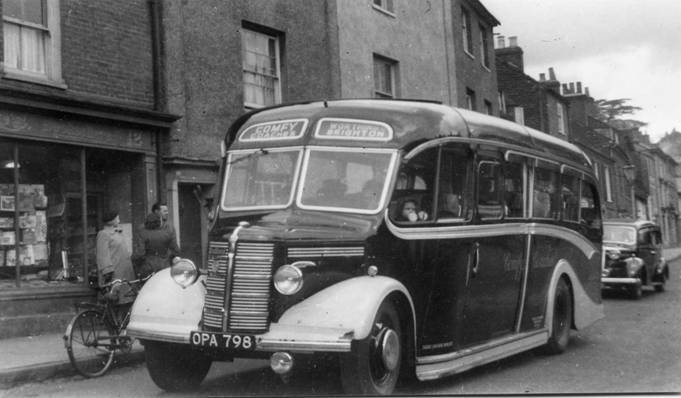 The Maudsley NPC 777 was sold, and stayed in the local area operated by three other companies up until 1969. Also in 1953 the company opened a booking office in Castle Street Farnham, which offered over one hundred licensed destinations. The popular day excursions to the South Coast continued, with trips to Clacton on Sea, Widecombe, and Bekonscot Model Village being a few of the popular excursions on offer. 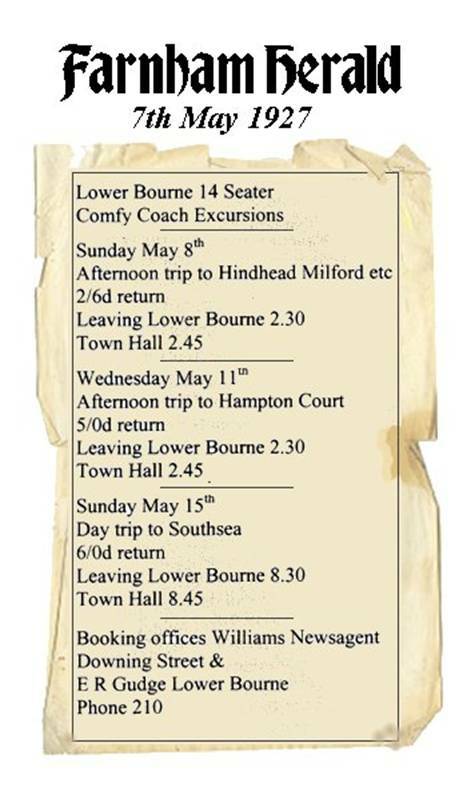 The company now operated three-day excursions to Blackpool, North and South Devon, and other special excursions were on offer. The private hire business proved so popular, that on Saturdays during the summer months the assistance of other operators was required. Occasionally, assistance was required on a Sunday, with owned company vehicles being solely responsible for excursion and tour business during these busy periods. For the long distance work an extra fuel tank was added, and the seating capacity reduced for passenger comfort. Manning levels on the vehicles were also varied to accommodate some locations. For long distance day tours, generally those of over 300 miles plus a day (popularly known as Picnic Tours) allowance was made for two drivers to be available for one coach or three drivers to two vehicles, dependant on passenger numbers. 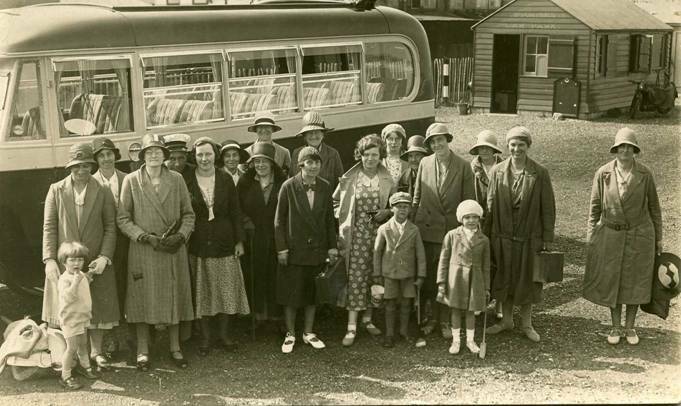 Contracts with the Education Authority and school trips were awarded to the company, and many people in the local area have fond memories of travelling on a Comfy Coach. 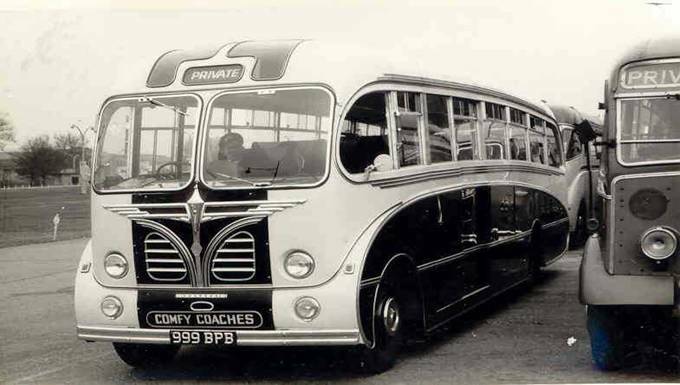 A further Bedford SBO with a 36 seat Plaxton body was added in April 1954, with another distinctive plate UPH 999. Bedford EUR 364 was sold to a company in Windlesham and was exported in 1957. 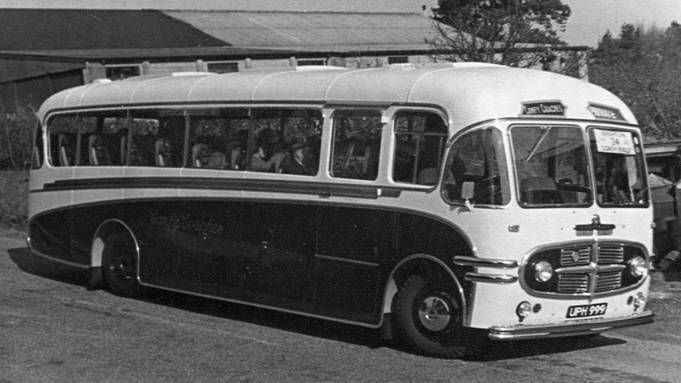 A second hand Bedford OB (JHO 213) with a 29 seat Duple body was purchased in March 1955. Special tours were also being undertaken, such as two week tours of Scotland with Farnham Town junior choir. June 1956 saw the addition of two 41 seat Bedford SBGs (999 APJ) with a Plaxton body, and 999 BPB, a Burlingham. 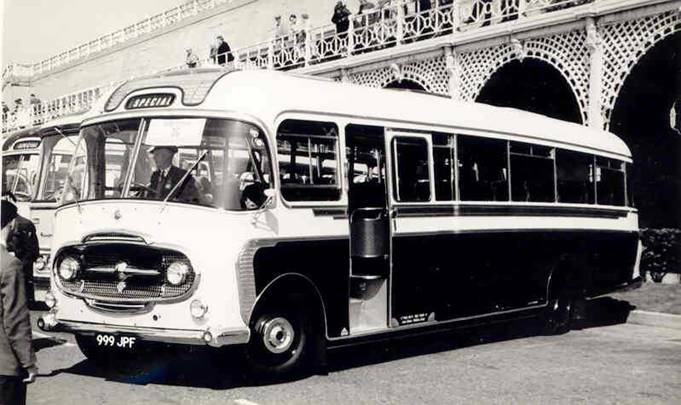 1956 was also the first year the company participated in the British Coach Rally at Brighton, the inaugural rally having taken place in 1955 at Clacton. The rally was held over two days, normally in April or May. On this occasion UPH 999 was entered on the 21st and 22nd April with driver Ron Bell. The first day consisted of the driving section, where the vehicle was timed on route, which that year commenced at the Marquis of Granby in Esher, through controlled check points to Madeira Drive in Brighton. Five driving skills tests were completed on arrival at Brighton, with a further three skills tests and the Concours d’Elegance, the judging of the vehicle, taking place on the Sunday. From the fifty four entrants that year, we are unsure of the overall position that was achieved. However, 10th position on the Concours d'Elegance was a creditable position for the first attempt. Three Bedfords, HPL 311, WG 4432 and LPB 250 were taken out of service that year. UPH 999 en-route, British Coach Rally 1956. No additions to the fleet were made in 1957. 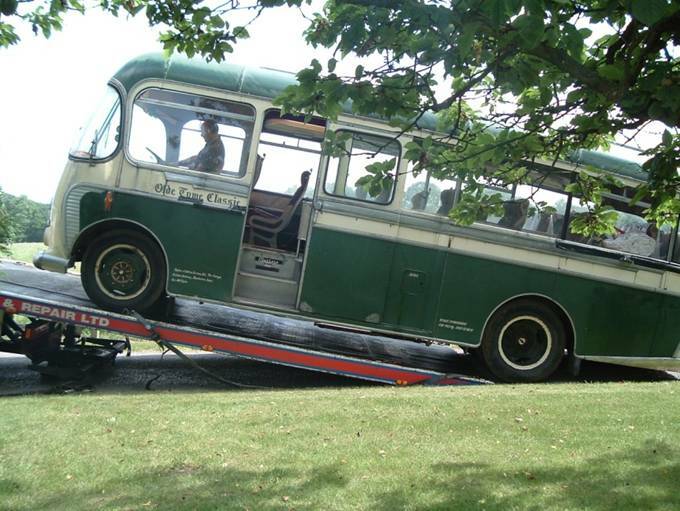 RPE 250 was entered into the British Coach Rally in Brighton, the driver again being Ron Bell. Although the vehicle was five years old, being first registered in April 1952, it was thought the overall style and comfort of the vehicle gave it a credible chance of success. As was usual, a lot of preparation work was carried out to present the vehicle looking its best. From a total of forty three entrants, the vehicle was placed eighteenth overall. RPE 250 en-route, British Coach Rally. 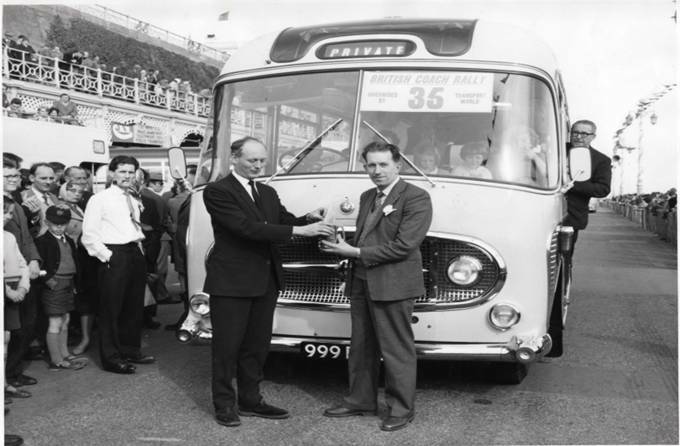 In June 1958 a 29 seat Bedford D4LZ2 (999 FPG) with Plaxton body was purchased, this vehicle being the most successful entry into the British Coach Rally made by the company. Driver R Bell achieved First in the Road Section and Driving tests, and Second in the Concours d'Elegance. 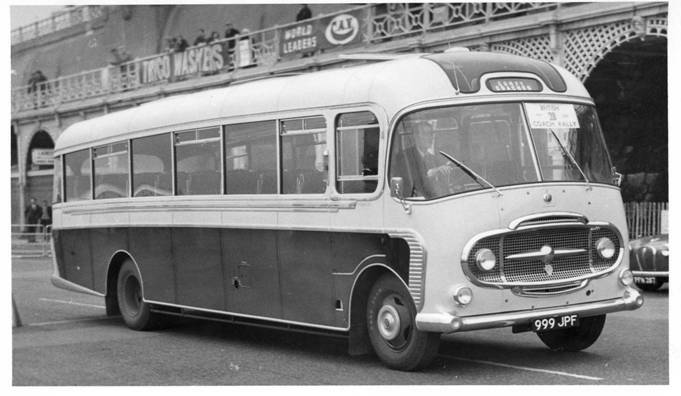 In April 1959, a Bedford SB3 (999 JPF) with a 41 seat Plaxton body was purchased, and the Bedford SB RPE 250 was sold to Amport and District Bus Services at Thruxton. Two entries into the British Coach Rally at Brighton meant another successful year for the company. 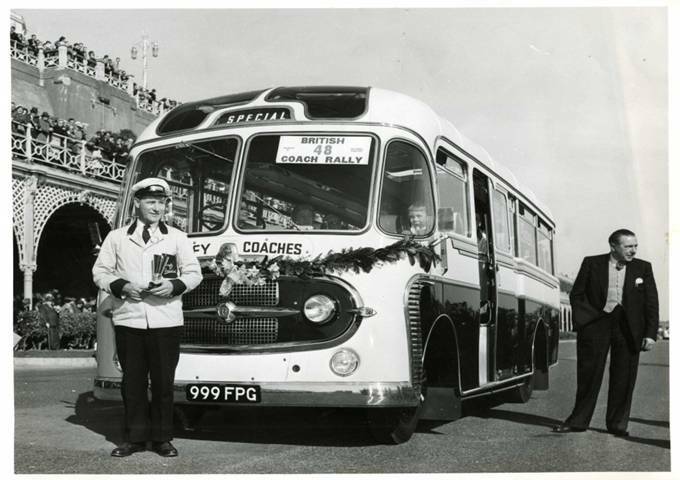 999 JPF with Driver R Bell achieved first class in the Road Section and driving tests, with Mr R Smith entering for the first time in 999 FPG for which he received Coach Driver of the year for 1959. 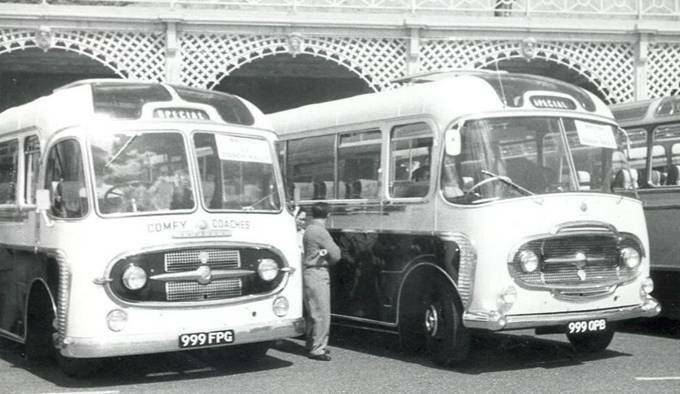 999 JPF in Madeira Drive, Brighton, 1959. 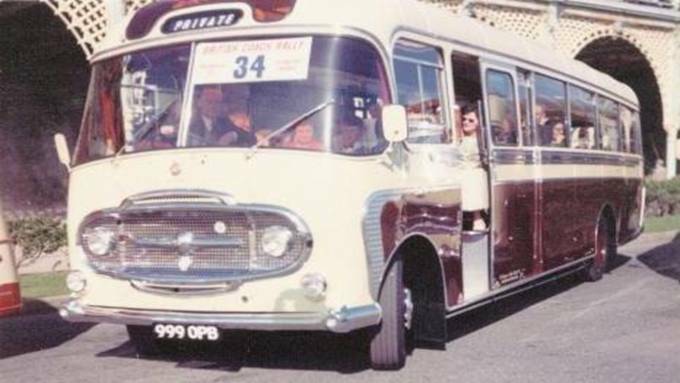 May 1960 saw the addition of two Bedfords with Plaxton bodies, these being 999 OPB, a 41 seat SB3, and 999 PPG, a 29 seat J4LZ3. A further Bedford J4LZ3 (999 PPL) was added in June, which was also a 29 seat Plaxton body. Disposals that year included, NPG 655, HOU 377, JHO 213, and OPA 798. Following the success of the previous year, it was decided to enter three competitors into the British Coach Rally. These were, 999 OPB driven by Ron Bell, 999 FPG with Ron Smith, and Bert Sawkins in 999 JPF. On the Saturday Ron Smith and Bert Sawkins were runners up in class one and two of the Road and Driving Test sections respectively. On the Sunday Ron Bell was runner up on the Concours D’Elegance in the class A Category. 999 FPG and 999 OPB in Madeira Drive, Brighton. 999 JPF in Madeira Drive, Brighton. 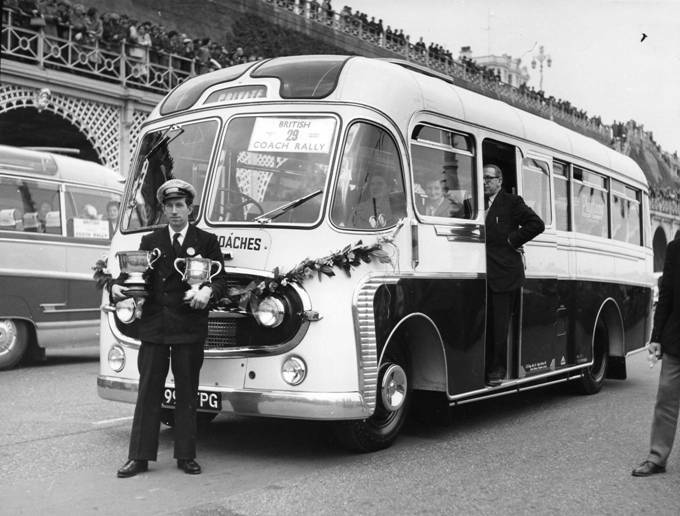 1961 was the last year the company purchased a vehicle; this was a Bedford SB3 with a 41 seat Plaxton body (999 VPA). No vehicles were disposed of, and this unfortunately proved to be the penultimate year for the Coach Hire side of the company. Despite this the company had two entrants in the BCR, these being 999 PPL driven by Ron Smith, and 999 OPB driven by Bert Sawkins. 999 OPB in Madeira Drive, Brighton. One of the few colour photographs available. Both drivers again achieved some success in the Road and Driving test sections of the event, with Ron Smith being runner up in the under 26ft class and Bert Sawkins runner up in the over 26ft class. We recently discovered a cine film taken at this event which has been transferred to DVD format. Currently, we are in discussion with Brighton University who are interested in storing the footage in their film archive section, which contains extensive information of cine film taken throughout the South East. by Lord Montague of Beaulieu. This concluded the company’s participation in the event, and the success they achieved through the years reflected the high standard set by the company and drivers during the day to day operation of the company. 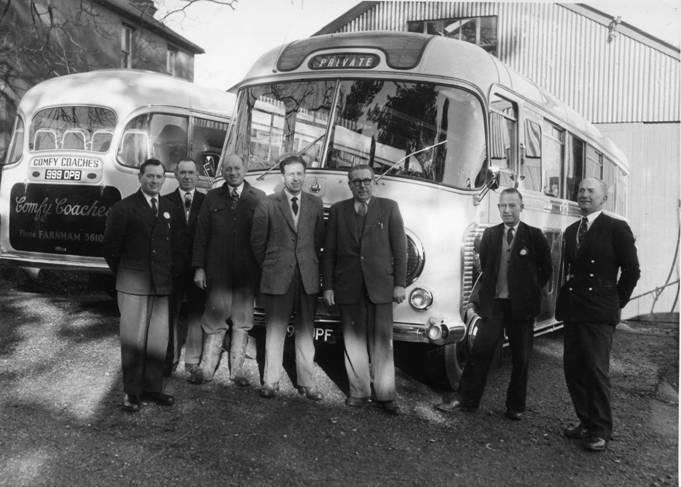 On the retirement of the founder Mr Ernie Gudge in 1962, his son Mr Norman Gudge considered the option of retaining the two businesses (Comfy Coaches Ltd and the service garage of E R Gudge), by employing a manager for one of the two and retaining full control. 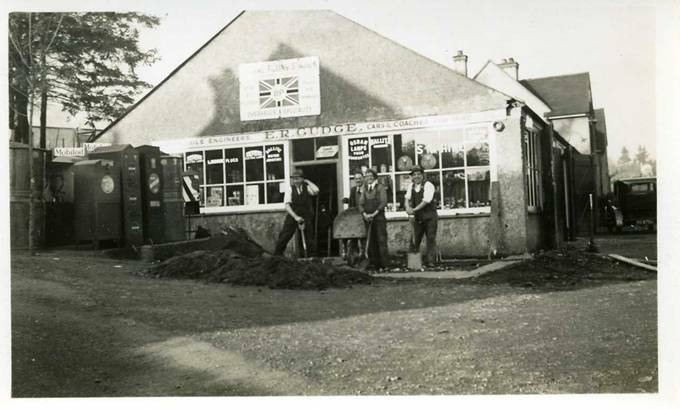 Both businesses were enjoying good support from the public, but due to the affordability of the motor car, it was perceived that more growth could be achieved by retaining the service garage. 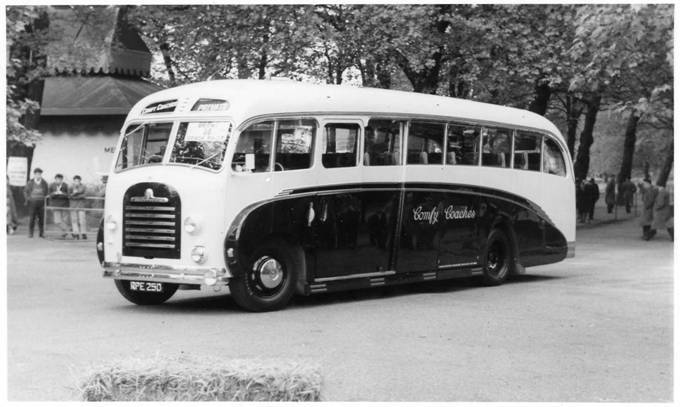 Comfy Coaches Ltd ceased trading in April 1962. The route licences were sold to Aldershot and District Traction Company, and the vehicles sold to several private companies. The vacated garage space was used for the expansion of car servicing and repair, which proved to be a successful Morris, Riley and MG dealership. 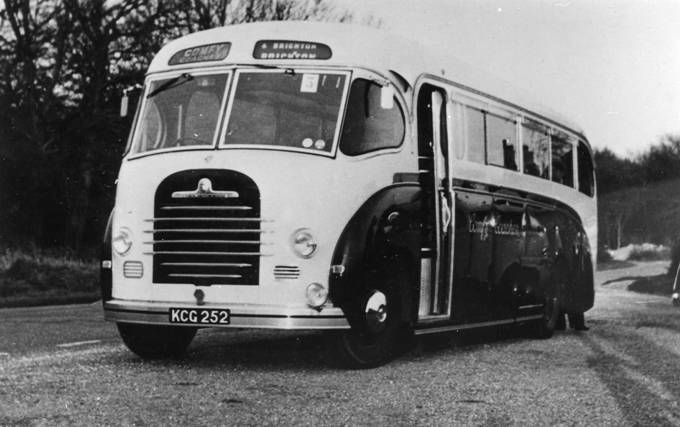 This further showed the strength and determination of the company to offer good service to the public, and why the travelling public from 1926 until April 1962 were able to say “That was a Comfy Coach”. In April 1962 Taylor’s of Sutton Scotney purchased 999 PPL, the 29 seat Bedford J4ZL with a Plaxton Body, which they operated to around 1993 in the latter years as Nostalgic Tours. During 1994 Mr Norman Gudge was looking for a former Comfy Coach, with the view to restoration. Contact was made with Taylor's who sold the coach back to Norman Gudge in April 1994 some 32 years after the original sale on the demise of Comfy Coaches. As is always the case, appropriate storage facilities proved to be a problem and after a couple of moves the vehicle ended up residing in the corner of a farmyard. A significant amount of mechanical renovation was undertaken at this time, but the body remained untouched. During early 2004 Mr Roy Gudge, the founder’s grandson, contacted Mr Phil Harris and myself regarding recommencement of the restoration of 999 PPL. 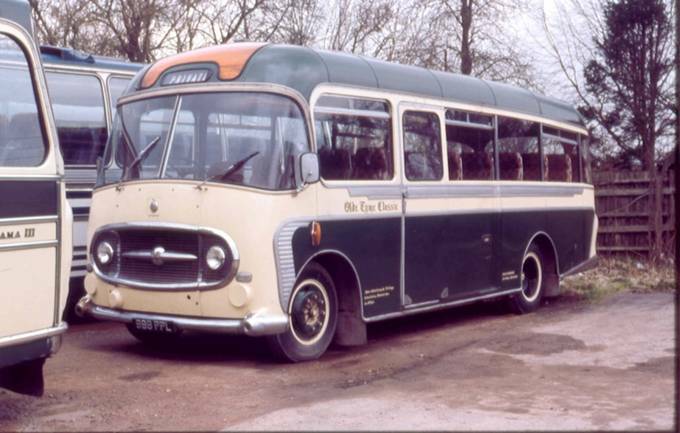 Phil Harris has an interest in all types of transport vintage and otherwise, and my connection being that my father was a driver for Comfy Coaches from April 1947 until closure of the company in April 1962. 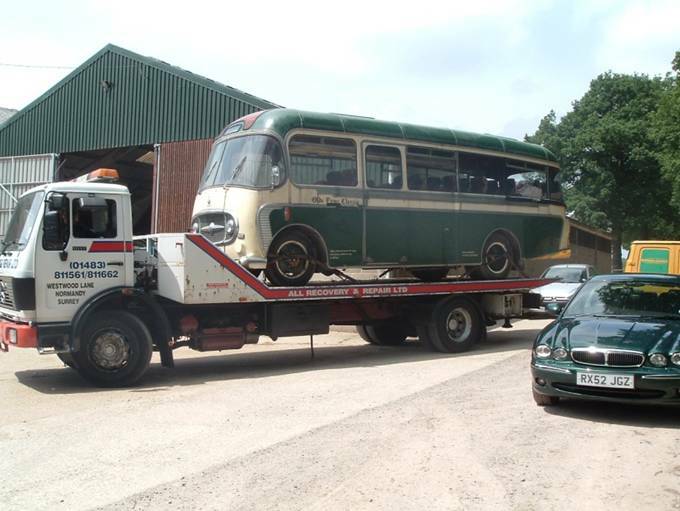 Prior to our involvement, the coach was given to Mr Ken Hatcher, who was an apprentice mechanic with the company in the early sixties, and who as a hobby, has carried out several vehicle restorations over a number of years. Several meetings took place during 2004 at which the first thing discussed was the problem of suitable storage. Several options were looked at for the provision of covered storage to enable the restoration of the vehicle. The opportunity came along when accommodation became available in a modern farm building that was being used to house several vehicles, some of which were under restoration. A section of this covered area has now been leased from ADORR, a group of enthusiasts that own and restore vehicles once operated by The Aldershot and District Traction Company. They also have links with the Aldershot and District Bus Interest Group. A new battery was fitted, and the fuel line cleaned through. After a few attempts, and some cleaning of the distributor cap, the engine proved to be a good runner. 999 PPL, having been driven this far, had to be winched onto the lorry bed as the handbrake failed. The vehicle was driven out of the field and down a drive to the waiting recovery vehicle. Not wanting to stop a good thing, the vehicle was driven straight onto the lorry bed, with little or no hesitation. The journey to the new location took the vehicle through Lower Bourne past her original home, Crossroads Garage, her first visit for 43 years. The group involved in the restoration of 999 PPL, namely Roy Gudge, Ken Hatcher, Phil Harris and Phil Sawkins, are also undertaking the social history of the company. To that end we have formed Comfy Coaches Interest Group to collate information and collect memorabilia of the company. Several other enthusiasts have now joined the group and it has been formally set up. However, the project has a long way to go, and I would like to hear from anyone who has information or access to photographs regarding the company. APTS have been very helpful in this aspect of the research, and we would like to thank Bob Jenner Hobbs for his help and consideration given to the research, and recommend his website www.na3t.org to all transport enthusiasts. 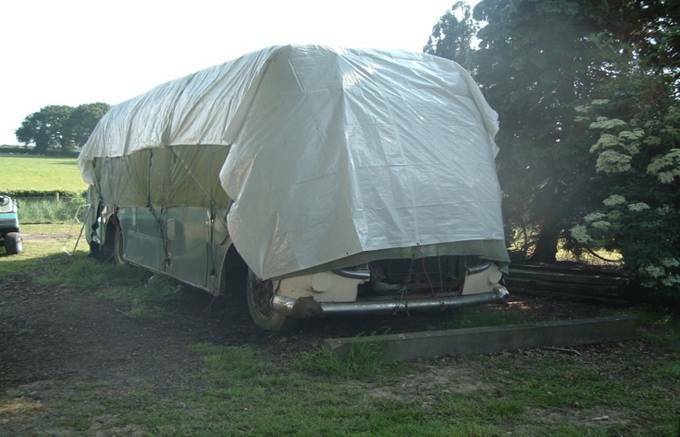 We would also be interested to hear from anyone who has information on restoration of the vehicle; any tips on do’s and don’ts would be gratefully received, as would the location of possible spares for purchase. The interior will prove to be a challenge, and information on the availability of seat and floor coverings would be much appreciated. For those who would like to contribute information, or join the interest group please contact Phil Sawkins on 01483 568471, or mobile 07801 448176 by email I can be contacted at philsawkins983@btinternet.com.